The worst thing about a limited edition coffee – blend or otherwise – is that it is only going to be available for a short period of time. Actually, this can be a great thing when you’re interested in trying new coffees and don’t want to get hung up on one brew. But when the limited edition hits all the right notes, all you can think about is the fact that you want to get in as much as you can before it is gone. 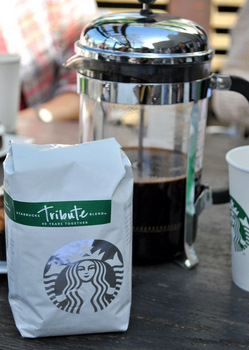 I have to say that this last statement describes the way I feel about the Starbucks Tribute Blend. I heard that Howard Shultz said it was one of the best cups of coffee he has ever had and I believe it. The coffee is a blend of Aged Sumatra, naturally processed Ethiopia, Colombia and Papua New Guinea beans. They are all roasted before being blended. Aged Sumatra is one of my very favorite coffee, with its rich and deep flavor, and I was very pleased to taste how strongly that coffee influences the Tribute Blend. The coffee is a bold, dark coffee with great berry, pepper and hazelnut tones. There is a some smokiness to the coffee, as well, but it is very smooth and has almost no bitterness to it. You’re hit with the berries with the first slurp, they fade into spicy nuttiness, and come back for a very long lasting and fruity finish. This coffee is available as whole beans and as Via at Starbucks stores. The Via version is very close to the whole bean version, but I didn’t think that you got quite the same lasting berry flavor with the Via. Some stores will brew it as their bold offering in the next couple of weeks, too. If you have time, get the baristas to make a french press for you so you can really enjoy its flavor to the fullest – and can savor it without just taking it in a to-go cup.